This product has been the talk of the town for sometime now but GlitterBuzzStyle has had a chance to try it out and we are telling you its a must have! Perfect for all your make-up needs, BeautyBlender has style, a fresh appeal and is the perfect necessity for a woman who loves her make-up! 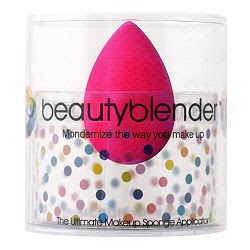 Just because Beautyblender is a simple little sponge it’s created without edges to eliminate visible lines and streaks. This way you can look as beautiful as all the superstars who have that flawless image. Use Beautyblender damp when applying wet/dry make up. When Beautyblender is wet it is normal for it to expand to nearly twice its original size. Wash after use and place in the Beautyblender insert pedestal to dry. The Blender Cleanser makes it easy for us ladies to apply and clean our tool so the next day we have a clean applicator. With the cleanser its so easy to complete this step since it takes only a few minutes. Blendercleanser is a lightly lavender-scented cleanser that’s free of dyes and skin irritants. It’s soothing soy-based, low-suds formula breaks down rapidly, making it earth-friendly and fun to use. Soy has the added benefit of being one of nature’s finest moisturizers, so by all means, clean up with class and do it often. Directions for using Blendercleanser: Wet Beautyblender. Apply a dime-sized amount of Blendercleanser to soiled areas of Beautyblender. Work into a lather, rinse, repeat if necessary. Squeeze to remove excess water. Set Beautyblender on insert pedestal to dry. Get your beautyblender and see what all the hype is around this amazing product. This little gem from Cult Beauty (www.cultbeauty.co.uk) is one of those products you never realised you needed until it came along and swept you off your feet. 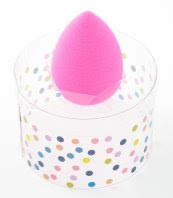 With a narrow point to negotiate the eye area and a soft rounded base to deliver foundation evenly to the face, the Beautyblender cosmetic sponge, £14.50, is the must-have make-up tool of the moment. A sponge to dip in foundation and ‘bounce’ on to the skin, this gives amazingly even coverage. Be patient, though – it may initially take a little longer to apply make-up, but after a few tries you’ll wonder how you ever lived without it. You are currently browsing the Beautyblender's Blog blog archives for November, 2008.